Are we a Tech Nation? According to a new report, more and more of us are working in digital technology companies. Research led by Tech Nation has found that 1.46 million people (or 7% of the workforce) are employed by more than 47,000 digital companies across the UK – and of these just 250,000 are working in inner London. 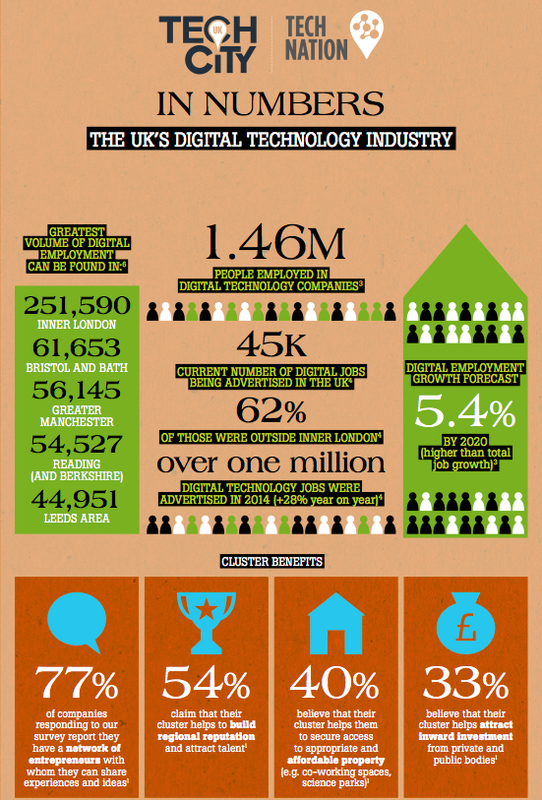 74% of digital companies are located outside London. To put that in perspective, according to other government figures, agriculture employs 535,000 workers, construction 2.2 million and manufacturing 2.6 million. So nearly three times as many people tend computers instead of animals. Heartening stuff, and a welcome antidote to some of the more extreme London-oriented digital stories seen in the media. The highest density clusters in the report are Brighton & Hove, Inner London, Berkshire (including Reading), Edinburgh and Cambridge, while the highest rates of digital employment are in London, Bristol and Bath, Greater Manchester, Berkshire and Leeds. It is easy to be cynical about the timing of the government-backed report, with an election coming up fast. I’d also query the definition of ‘digital’ – my PR business makes it in, which seems to show a wide classification range (not that I’m complaining). The headline findings that certain sectors have more digital companies than the national average (Brighton 3.3x, Cambridge 1.5x, for example), is interesting, but needs to be put into context. Brighton employs 7,458 people in digital, out of a population of 155,000 – under 5% compared to other clusters that potentially have a greater proportion of digital workers. 77% of respondents have a network of entrepreneurs with whom they share experiences and ideas. This rises to 90% in Cambridge. 54% believe their clusters help attract talent (65% in Cambridge). 40% believe their cluster gets them access to affordable property (such as science parks or co-working spaces). For Cambridge, access to advice and mentorship was seen as twice as important to growth than nationally (scoring +100%), and the positive perception of the Cambridge brand (+62%), was also a key driver for expansion. Issues highlighted in Cambridge include poor transport infrastructure (scoring -111% compared to the UK average) and lack of available property (-31%). This clearly demonstrates that to succeed and grow, tech businesses need to be part of an ecosystem that provides support, the right conditions to start (and grow) and that more and more of these are springing up across the UK. Nurturing a cluster takes time, so everyone involved, from local government to academia and investors have to think long term if they want to develop a tech ecosystem in their area. What I’d like to see is companies and regions use this report as a starting point to build closer ties. Firstly, any businesses that feel they’ve missed out need to get on board and be given the chance to be added to the report. This is vital to keep it as a living, interactive document that maps changes over time. Secondly, local government and organisations need to take a look and make sure that they are reaching the companies in their area, and providing them with the conditions for growth. At the very least local networks (or in their absence, local councils) should be making digital companies aware of their existence, and what they can do to help them. That way more sub clusters will form and grow, strengthening the overall picture. I don’t think we’re yet the full Tech Nation that the report and research promises, but we’re definitely on the way – we therefore need continued focus and investment if we’re going to move forward, across the country.